Not to be confused with Scaling the Mountainside. 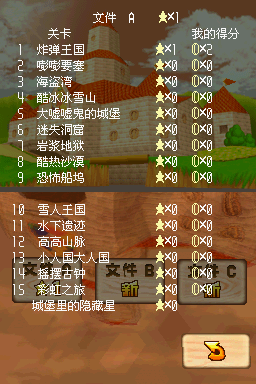 Scale the Mountain is the first mission of Tall, Tall Mountain in Super Mario 64 and Super Mario 64 DS. The mission's objective is to reach the top of the mountain. The player starts at the base of the mountain next to a small pond. In front of them are a trio of Goombas, past them is a ramp that leads to two gaps the player has to Long Jump across; failing to cross the first one will have the player land on the ground below, but failing the second will result in a lost life. 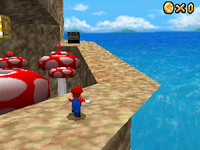 Beyond the gaps are several mushroom platforms, past those is a series of platforms that lead further up the mountain with Red Coins and Monty Moles on them. The player can either take the platforms or continue down a path with Bob-ombs and a Chuckya, followed by a bridge. Afterward, there is an Ukkiki and a Fly Guy, with the Ukkiki attempting to steal the player's cap, and a log the player has to roll in order to get across the gap. After the rolling log is a large slope with several iron balls rolling down it. Alternatively, there is a different path with Bob-ombs (that the aforementioned platforms will lead to) the player can use to go around the slope with the boulders. At the end of both paths is a large gap the player has to Long Jump across followed by a Fwoosh that will attempt to blow the player off the mountain, causing them to both lose a life and their cap. Past the Fwoosh is a grassy area with Goombas, though the grass will make it difficult for the player to jump. After the grass field is a narrow bridge over a waterfall, and across it is the peak of the mountain where the Power Star is found. This page was last edited on February 18, 2019, at 03:43.